Why did I take so long to write about Heroes Among Heroes? I should have whipped out this review a month ago! It could be that I left the screening a bit frustrated. Quick story: When I was rushing to get to the theater, I was parked less than a block away. What I didn’t take into account was that we would be getting the worst downpour of rain that night. I can suffer running through a storm but what I didn’t realize was that my iPhone would be caught in the rain and all of a sudden, have no audio when I tried to make a call! Quick Google searching later let me find out that if water gets near an iPhone’s headphone socket, it makes your phone think it is constantly connected in headphone mode. The Solution: Place your phone in a pack of rice overnight. Worked for me as it absorbed all the water out of that thing! Regardless of being phoneless for a day, I had quite an enjoyable time watching a nice print of Heroes Among Heroes. It’s not the best Yuen-Woo Ping film, but it was good to see my faith in Yuen still last after a disappointing screening of True Legend. The story cribs a bit from other popular Hong Kong films of the era such as the Once Upon a Time in China series, but 1993 was a year of excess when it came to those kinds of films film. How much excess? There were over five Hong Kong films revolving around the Wong Fei Hong character! Not only that, but at least three of them were worked on by Yuen-Woo Ping. Talk about milking it! Imagine if next year there were five Robin Hood films and they were all directed or produced by Ridley Scott. Madness! How did Yuen-Woo Ping not die of exhaustion? The Hong Kong Film Archive and Hong Kong Cinemagic websites state he was not alone in directing these, as Chan Chin-Chung is also credited as a director. Who the hell is he though? This seems to Chan’s only film credit. Joining him in a one-time only role is Yuk Wong who co-starring alongside Donnie Yen as the role of Wong Fei Hong himself. Then much like Chan: nothing ever again! It doesn’t really matter as it’s Donnie Yen as Beggar So who is the real star of the film. In fact, I think even Ng Man Tat (lots of “wasn’t that the coach from Shaolin Soccer?” after the screening) and Sheila Chan take up a large amount of the screentime. Sheila has some embarrassing prosthetic teeth in this film…people gasped in the audience when they first saw her pearly whites. Both Sheila and Ng Man Tat both have a good amount of screen time for their comedy scenes. 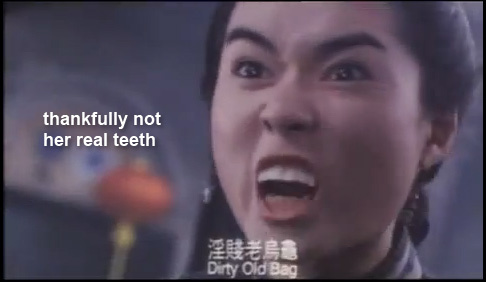 If you aren’t a fan of the comedy relief in Yuen Woo-Ping’s other films, this won’t change your mind. Personally, I found it forgettable outside the visual memory of her teeth. Ng-Man Tat says this during the film…apparently! Despite a confusing production history and joke-explaining subtitles, Heroes Among Heroes is an entertaining if lesser picture from Yuen Woo-Ping. The anti-drug PSA themed opium tale is not nearly as memorable as the more popular Iron Monkey also from 1993. On the other hand, we get the bonus of not having any child actors which is a definite downside to Iron Monkey for me. Kids ruin everything. Many of the action scenes during the first half of Heroes Among Heroes are far too short. By the time you’ve asked yourself “was that it?” the characters are already on to their location. The later action scenes, are more extended and extravagant. These scenes include Donnie Yen fighting a member of the Red Lotus group which involves Donnie dodging the rivals long hair used as a fighting extension. Another strong action scene involves Chan Chin-Chung who sits at a dinner table and has a seated kung-fu battle…with his fist on fire! Perhaps he burnt his bad so badly that he didn’t want to do another film again? What any man would do when they light their hand on fire. If the above sounded interesting, I’m unhappy to report that Heroes Among Heroes has not been treated kindly on home video. Two Region 1 DVDs of the film have been released with one under the title Fist of the Red Dragon which is only available in an English dub. I’m feeling especially lucky now to have caught an actual film print. In comparison to much of Hong Kong’s modern day output, this film feels a lot stronger than it probably ever did in 1993. If you need something that has the Iron Monkey and Fong Sai Yuk kind of flavor, you might just find it in Heroes Among Heroes…that is if you aren’t bored about another tale of Wong Fei Hong. This entry was posted on Saturday, August 27th, 2011 at 5:20 am and is filed under 1990s, donnie yen, hong kong, yuen woo-ping. You can follow any responses to this entry through the RSS 2.0 feed. You can leave a response, or trackback from your own site. Never seen this, it was showing in the Caribbean on our honeymoon in 1994, for some reason my lovely new wife didn’t fancy it! Whups, didn’t see you type this. Would have been a crazy honeymoon. You, your wife and Donnie Yen and Ng-man tat.